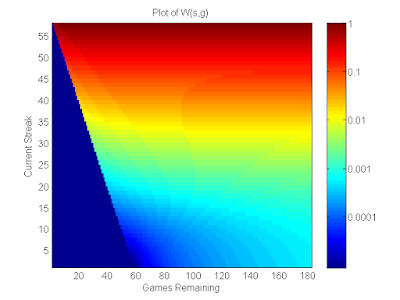 In order to maximize your probability of beating the streak, you should (1) predict the probability that a batter will get a hit in a given game given the game parameters and (2) determine if it's worthwhile to risk your current streak in order to possibly improve it by 1 or 2 games. In this blog post, I outline my solution to (2). In previous blog posts, I've hinted at what I do to solve (1) and will continue that discussion in a later blog post.